Internationally recognized artist Nina Weiss has been painting and drawing the landscape for over thirty years, and the lush feel of her painted surfaces are alive with gesture and emotion. Weiss frequently bikes through rural Michigan for inspiration as well as traveling abroad to document the landscape. 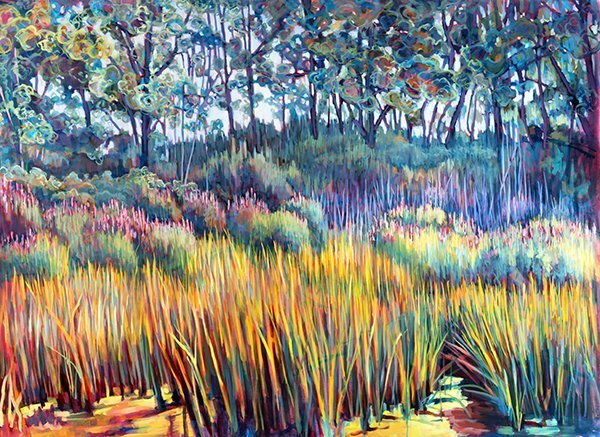 She completes her large-scale layered compositions of deep, saturated color in her studio in Evanston, Illinois. Weiss’ work is represented in private and corporate collections and can be found in 100 Artists of the Midwest, Artists Homes & Studios and The Chicago Art Scene. In addition, Weiss has taught at The School of the Art Institute of Chicago & Columbia College Chicago.